As a grandparent, can you assume custody? As a grandparent, you have had the ability to watch your own children grow and have kids of their own. Your grandchildren are precious to you, which means that you will always want the best for them. In the case that your child undergoes a divorce from their spouse, many questions can be in the air. The most important of these questions being who will assume custody of the child? In this blog, we will be discussing the laws in Pennsylvania regarding grandparent custody of a minor child. Hopefully, by reading this blog, you will have a better understanding of the right of biological parents, grandparents, and the current custody laws of the state of Pennsylvania. 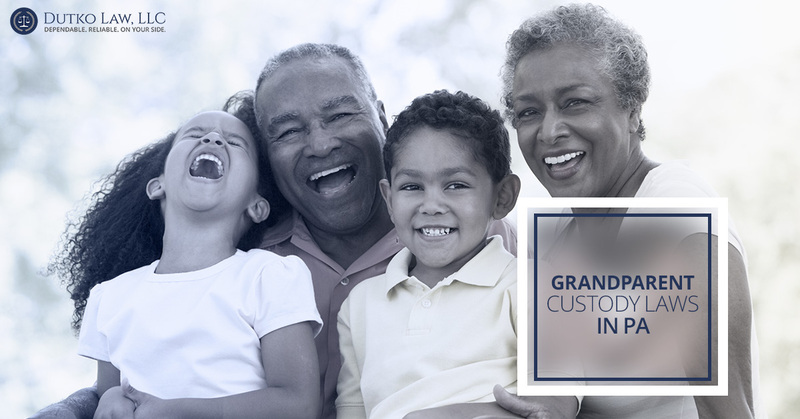 With a great understanding of your rights as a grandparent, you will be able to conclude whether you can legally ask for visitation and even physical custody of your grandchild. When is custody an issue? When the biological parents of a child are undergoing a divorce, child custody is a concern. Most ex-spouses can quickly struggle for custody of their child. For instance, some parents can argue for full-custody of their child and limit the visitation rights of the other parents. Custody questions can also arise when the biological parents of a child are ruled unfit to care for their child. Parents that cannot care for their child, under the legal parameters, such as providing food, shelter, education, etc., they can be denied parental rights. If either of the biological parents are not able to provide for their child, the biological grandparents can petition the court of visitation and partial custody. What are the circumstances for custody? Children can naturally have strong attachments with their grandparents. Grandparents can spoil and support their grandchildren, and even provide them with an environment where they can feel safe and protected. Because children can naturally gravitate to their grandparents, their relationship can be strong and nurturing for both parties involved. Though grandparents and grandchildren can have a strong bond, this relationship doesn’t immediately mean that a grandparent has the right to petition for custody. Child custody of a minor typically requires special circumstances in order to move custody to a non-parent. There are three circumstances that could mean that a grandparent could qualify for custody. If a child’s birth parents have died, a grandparent can step in as the full-custodian of the minor. However, if only one of the child’s biological parents have died, a grandparent can only file for partial custody. Of course, this is all dependant on the quality of care the surviving parent provides. An example of this would be an estranged parent that has not had involvement in the child’s upbringing. Divorce of the parents can allow grandparents to petition partial custody. Divorce, and if the parents have been separated for six months or more (while a divorce is filed), also allows grandparents to file for partial custody of a minor. Residential circumstances can grant grandparents the right to petition for visitation or partial custody. If the child has resided with a grandparent or grandparents for 12 months or more, after the child was removed by a parent, the grandparents can still file for partial custody. An example of this would be if a parent was not able to provide for their child for at least a year and had the grandparents assume care for that length of time. And, if the parents were then able to provide for their child and removed them from their grandparents residence, partial custody rights can still be granted to the grandparents. Why would a grandparent be granted partial custody? Grandparents can be awarded custody of their grandchild in the case of the above situations. However, a court will only give grandparents custody rights if it is in the best interest of the child. In most cases, all child custody cases are handled depending on what outcome is best for the interests of the child. Grandparent custody is typically only awarded if the child is genuinely in better care with their grandparents. The child’s emotional, physical, and mental well-being. The relationship that grandparent and the child share. Potential impact on the child’s social and educational growth. A child’s emotional well-being is a top priority when it comes to assigning custody. As stated, the court will only rule in favor of the child. If a grandparent is able to provide a stable, loving, and supportive environment for the child, they can be granted partial or even full custody of the minor. Depending on the strength of the relationship between a grandparent and a minor can also affects who will receive custody of the child. For instance, if a child and their grandparent has a very strong bond, the court might reach the conclusion that the child would be better suited under the grandparents care. Child preferences is also weighted in a custody case as well. Though this factor is rarely used, as it forced a minor to choose who will care for them, it can happen from time-to-time. In this situation, the minor in the case will be given the opportunity to choose who they would like to have custody of them. The court will consider the social and educational impacts the child will endure under a grandparents care. For example, the age and quality of health of the grandparent is weighed when determining if they are a good candidate for custody. If you are interested in petitioning for grandparent custody, you will need professional legal representation to handle your case. Even if you believe that you should be awarded custody, you will need to persuade the court that you are a worthy candidate for custody, rather than the biological parent of the child. Contact Charles Dutko of Dutko Law today! He may be able to assist you in your family law matters. Contact us today for our services!